I love this French recipe by Jacques Pepin and Julia Child. I found it in the book “Julia and Jaques Cooking at Home”. The book gives you variations on this recipe by Jacques and Julia as well as detailed instructions and notes. So check it out if you want more. 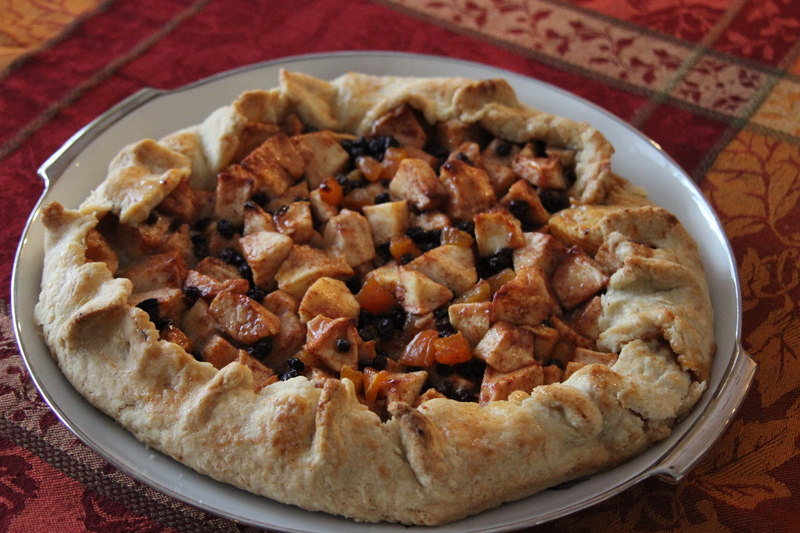 I have made and enjoyed this recipe several times in the past and most recently I made it as an alternative to the traditional apple pie for a Thanksgiving dinner. It was a hit. Here’s mydinnertoday’s simplified cooking instructions. How to make: Start with the dough. Put the flour, butter, salt, and sugar in a bowl of a food processor. Run the processor 8-9 times for a second or two each time until you get a crumbly mix. Add all but a tablespoon of the water and run the processor again for no more than 5 seconds. If the dough is not sticky yet, add some more water and run the processor for a couple more second. Do not over beat. Form the dough into a ball by pressing it and put it in a plastic wrap. You can use it immediately or let it rest in the fridge for an hour or two. When ready to roll the dough, flour a flat surface, flour a rolling pin, and start working with the rolling pin to flatten the dough into an oval, approximately 18 inches long and 15 inches wide. Sprinkle with flour to keep the rolled surface from sticking on the table. Turn it upside down a couple of times as you keep rolling to flatten it. Use the rolling pin to transfer the dough to a flat pan. No need to butter the pan. To make the glaze, mix the preferably strained apricot jam with the Cognac or Grand Marnier until well blended. Using a brush, apply a layer of the mix to the center of the dough that you have already placed in the pan. On to the filling. Core and peel the apples. Cut them is small cubes and mix them with the sugar, cinnamon, currants, and dried apricots. Spread the filling to the center of the dough. Leave at least 2 inches at the edges of the dough uncovered. Now, carefully, lift the edges of the dough and pinch them with your fingers to help them stick and stand upright to protect the apples from overflowing. See the photo. Add some pieces of butter to the top of the fruit and sprinkle some sugar on the dough. Bake in a pre-heated 400F/200C oven for about an hour or until the tart is nicely browned.